Funny Garden Gnomes? There's no such thing, only tacky, awful smug little porcelain idiot gnomes. The Great Garden Gnome Massacre puts an end to the myth that is 'funny garden gnomes' and introduces us to a whole new world of garden ornament. A better world. A revolution. When you think of a garden gnome what image does your mind conjure? An adorable little porcelain garden ornament which fills lives with joy? Or like the rest of us - a smug little tacky ugly china idiot ruining the ambience of an otherwise quite nice outdoor space. If you're in the latter camp, then let us introduce you to a revolutionary garden ornament - one which will make those little garden gnomes quiver in their china boots. 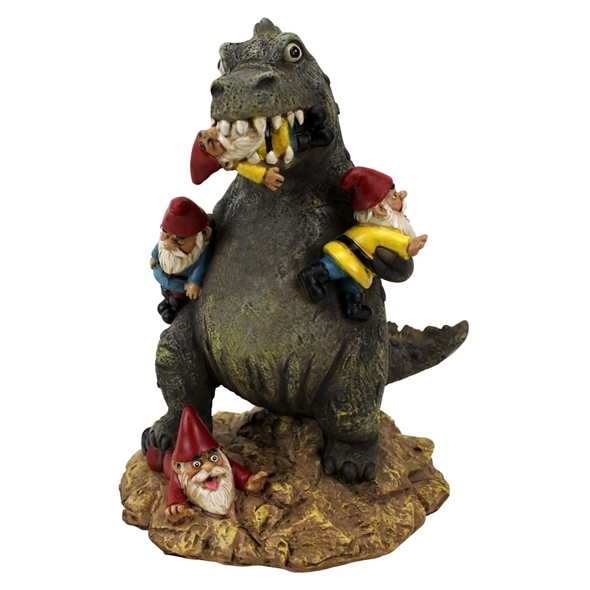 This is 'The Great Garden Gnome Massacre' - a polyresin hommage to all members of the anti garden gnome movement. The Great Garden Gnome Massacre is a modern masterpiece, so we would recommend you snap yours up before The Louvre dedicates a full exhibition to this monumental work of art. It depicts a green monster/beast (many have commented on his resemblence to the Monster Muncher from the Chewit adverts - though we can confirm this is a coincidence). This monster is mercilessly killing four awful little garden gnomes, thus showing his allegiance to the anti-gnome brigade and essentially becoming a hero. He likes to chew it, chew it (again, purely a coincidence) and has even got one of the tacky little garden guys in his mouth. To some this might seem like violence, but to many this is an essential step to ending the horror that is garden gnomes. 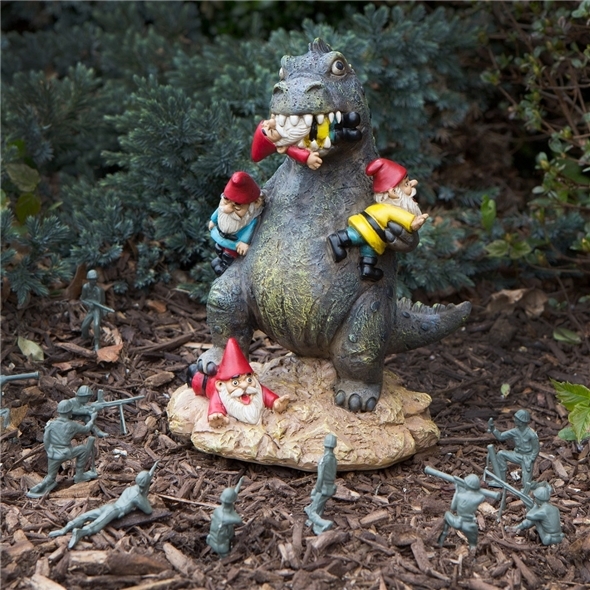 These little buggers have no right to ruin our gardens, and we will start a revolution with The Great Garden Gnome Massacare and put an end to tacky garden decorations, one ceramic gnome at a time. This is a fantastic gnome, so very different to what is already available.. great idea!